Whether your child is a beginner in French or has been attending French immersion school, they will find their right place at Canoe Island French Camp. From the first “Bienvenue” as they step onto the dock to the last A bientôt as we wave goodbye, they will be immersed in the language to their ability. Morning classes are at five levels from débutant to avancé with a native French instructor and a French-fluent American instructor leading every class of 6-10 campers. Some parents have told us that because of the small class size and the customized instruction, their child learned more at French Camp than in a semester in school. 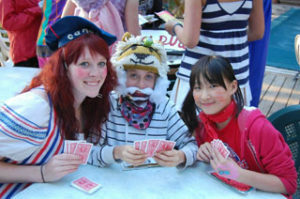 Session 3 is our most intensive French session and is designed for campers who have started learning French. Canoe Island French Camp is not just a language experience. Your child will gain from all the benefits of attending summer camp: increased self-reliance, self awareness, new friends, and the ability to enjoy new experiences (and food) within the security of a private island where just the campers and staff are present. With only 50 campers in each session, everyone gets acquainted quickly. Tipimates are arranged by age, French language class by ability, and the campers choose their activities so they very often are with at least three different small groups each day. 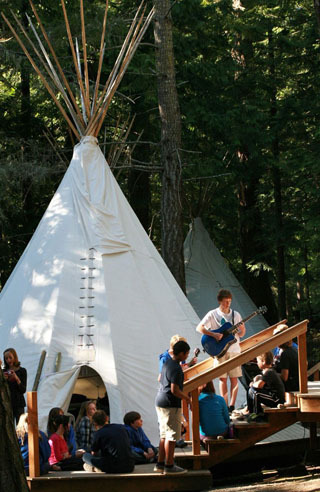 Lodging is in canvas tipis on wooden platforms with beds, mattresses, electricity, and wooden storage boxes. With only five campers and a counselor per tipi, campers enjoy close camaraderie, often returning year after year to see the friends they made at camp. The counselors, many of whom are from France or other francophone countries, share their culture, food, and history with campers. Surrounded by sparkling blue water of Puget Sound, this private island is waiting for you to explore its mile of shoreline, mossy promontories, and secluded beaches.